Botrytis leaf blight (BLB) is a fungal disease that occurs in many of the onion growing areas of the world. The causal organism, Botrytis squamosa, causes leaf spots (lesions) and maceration of leaf tissue resulting in leaf dieback and blighting. The lesions are whitish in color, from 1-5mm in length, and most are surrounded by greenish-white halos that appear water-soaked when first formed (Fig. 1). The centers of the lesions usually become sunken, straw colored, and may develop a characteristic slit that is oriented lengthwise in the lesion (Fig. 2). Older onion leaves are more susceptible than younger leaves to lesion formation and blighting. Figures 3 and 4 show seriously infected onion leaves. Under favorable environmental conditions (high rainfall, extended periods of leaf wetness, high relative humidity, and moderately warm temperatures 50 F-75 F), BLB can result in reduced onion bulb growth and yield. Severely infected fields often take on a yellowish cast as the result of coalescing lesions and tip dieback. Figure 5 shows the contrast between a heavily infected field on the left and a field with a low level of BLB on the right. BLB should not be confused with several other problems: (1) Botrytis leaf fleck caused by Botrytis cinerea. This disease is characterized by small superficial flecks on onion leaves. (2) Ozone injury, typified by irregular areas with tiny necrotic flecks that lack watersoaked margins. (3) Leaf tip dieback (often called blast) caused by hot and dry weather, water stress, other factors, or combinations of factors. (4) Rain and hail injury (Fig. 6) resulting in pale green to silvery spots and bruises that are irregular in size and shape. (5) Injury from foliar applied herbicides that cause pock marks (Fig. 7). The BLB pathogen overwinters as sclerotic (compact mass of fungi capable of surviving unfavorable environmental conditions). These are produced on infected onion bulbs left in cull piles, on mother bulbs stored for seed production, and on bulbs left in the field. The latter results in volunteer onion plants the following spring. Sclerotic also overwinter directly in the soil and on leaves that persist as debris in commercial onion fields. The sclerotia are formed on infected leaves (Fig. 8) and the necks (Fig. 9) and upper portions of bulbs before or after harvest. Infected leaves may be raked or washed together and persist as leaf tissue debris in which many sclerotic can be found. Sclerotic in the soil result from the disintegration and decay of infected leaves on which sclerotic were formed. 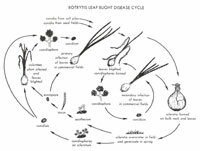 Sclerotic on onion bulbs in cull piles, on mother bulbs in seed fields, and on volunteer onion plants in commercial onion fields produce conidia (spores) that infect leaves on sprouted bulbs and onion plants in commercial fields. Sclerotic on the surface of the soil in commercial onion fields also produce conidia that can infect the leaves of nearby onion plants. Sclerotia on leaf debris produce conidia and also ascospores (sexual spores) that infect leaves of onion plants. Because ascospores are the result of sexual reproduction, they may serve as the source of new strains of the pathogen that are tolerant to fungicides used to control BLB. The ability of sclerotic to germinate and produce conidia repeatedly (up to four times) results in the production of conidia over an extended period of time. Sclerotic on the bulbs of volunteer onions produce conidia that infect either leaves of the same plant or those of onion plants in commercial fields. In the absence of seed fields and cull piles, it is suspected that sclerotic in the soil and sclerotic on volunteer plants provide the primary source of inoculum for outbreaks of BLB in commercial onion fields. The dense, tangled growth of leaves that develop from bulbs in cull piles provides conditions (little air movement and high relative humidity) that are favorable for subsequent production of spores on dead leaf tissue. This results in secondary cycles of infection in the cull piles. Similar secondary cycles occur slightly later in seed fields. Conidia are blown from the seed fields and cull piles to commercial bulb production fields and the disease cycles continue. Leaves of onion plants in commercial fields can be infected by conidia that develop from sclerotic in the soil. These infected leaves also serve as secondary sources of inoculum once conidia are produced on the dead leaf tissue (Fig. 10). Leaves of volunteer onion plants infected by conidia produced by sclerotic on the same plant also serve as a secondary source of inoculum. Leaves of onion plants grown for commercial production are repeatedly infected, and these serve as the source of inoculum for infecting new leaves throughout the growing season. To reduce the incidence and severity of BLB, cull piles should be destroyed, seed fields should be located well apart from commercial onion production fields, and volunteer onions should be rogued. At harvest, severed onion tops should be removed from the field and destroyed. BLB can be controlled by spraying with effective fungicides or combinations of fungicides applied on a 7-10 day basis starting approximately in mid-June and continuing until 7-14 days prior to undercutting, depending upon label requirement. Application of fungicides by ground spray equipment is more effective than that by aerial spray equipment. In IPM programs, where the disease is carefully monitored, the initiation of weekly fungicide sprays can be delayed until a critical period of one lesion per leaf is detected. Weekly sprays can also be delayed later in the season based on lesion counts, presence of secondary sporulation, green leaf count, and current weather conditions. Consult your local extension recommendations to determine which pest management practices are most effective in your area.